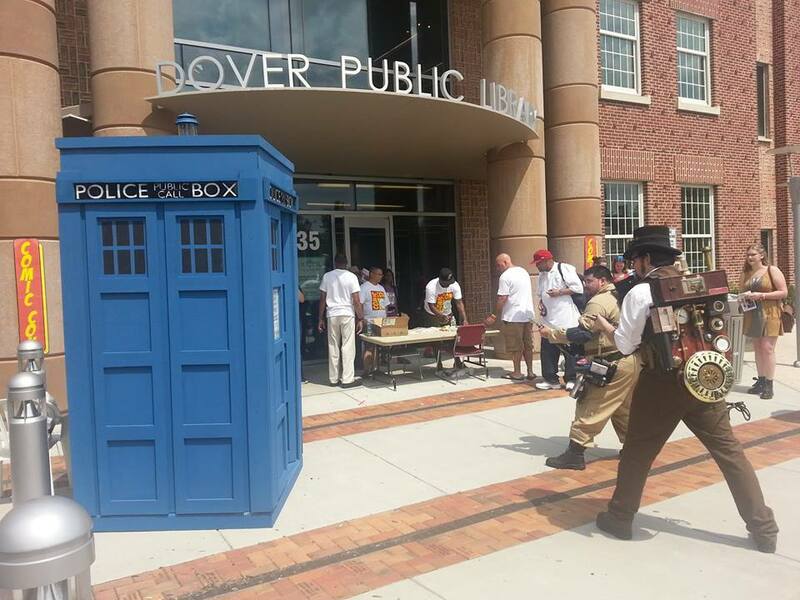 We received a call from the Delaware Public Library who were about to host there first ever Comic con. Mr. John Hollyday said that a Blue English Police Box had appeared out of thin air in front of the library. Then he and his wife witnessed a Full torso vaporous apparition, that later reminded them of the Old Librarian, fly into this Police Box. Then the crazy started to happen. We arrived and started to take PKE readings that lead us right to the Blue Box. The readings were off the scale. So I knew from them I had to blast this ghost out of that box. When I started to fire on it I see another stream next to me almost as if there was a 19th Century Ghostbuster standing next to me blasting the same blue box. That is when I realized this box was causing a space time rift. So I Told my new steampunk partner to increase the power output and aim for the light on the top of the box. We then released this Box from the hold of the Ghost librarian trapped her and powered down. I look over and this Steampunk Ghostbuster tipped his hat to me and said “Good show old man” as he faded back to his time. The Blue police Box then started to make a strange sound and faded away as well. After this PKE reading returned to normal. I started to write up the bill for the Holyday’s to pay. Find out who this Doctor is! Librarian looked just like what Dr. Stantz mentioned on his first encounter with a well known ghost in New York.